There are a lot of apps you can see and install on Your Androud Device to transfer files between Android Devices using W-Fi Network or Bluetooth/NFC but Superbeam is the first app that can create an ad-hoc network for sharing files between devices if no Wi-Fi network is present and that too at a Very High Speed (personally experienced 50Mbps). 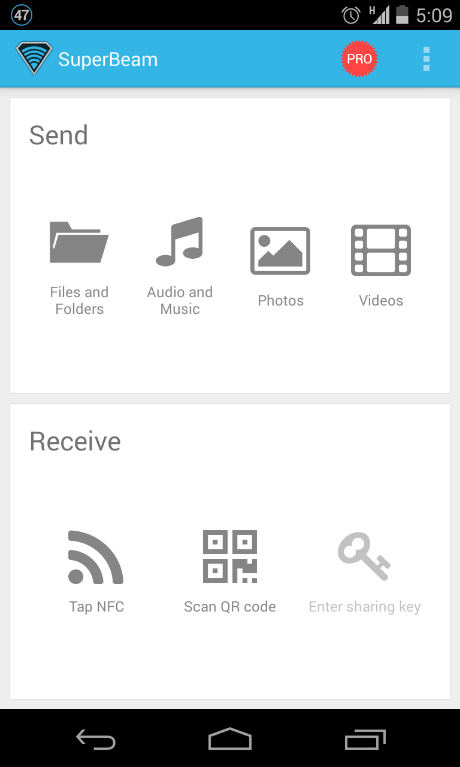 SuperBeam is the easiest and fastest way to share large files between Android devices using WiFi direct. Devices can be paired using QR codes (with the included QR code scanner) , NFC or manual sharing key available in Pro Version. You’ll need SuperBeam installed on both devices and then you’ll need to pair the devices using any of a number of methods, including QR Codes, NFC, or by typing a manual code. After you’ve set it up, sharing is as easy as picking the files you want to share and sending them to the paired device. You can even connect Superbeam to an Android device without Superbeam installed or to a computer by connecting those computer to the ad-hoc network Superbeam creates. SuperBeam Switches to hotspot mode automatically for devices that doesn’t support WiFi direct. Also, it can use existing WiFi network connection between devices in case WiFi direct fails. All received files are stored under “/sdcard/SuperBeam” directory by default, this can be changed in settings if you have a Pro version and it also detects duplicate files and adds No. to them.